Our Defence Experimentation Airborne Platform (DEAP) is a key enabling capability that is necessary to undertake airborne intelligence, surveillance and reconnaissance (ISR) research and development. The DEAP is a core component of the ISR Test Bed system that is used to undertake a range of research activities, from sensor phenomenology investigation of key imaging and ISR capabilities through to end-to-end ISR systems trials for Defence and national security. 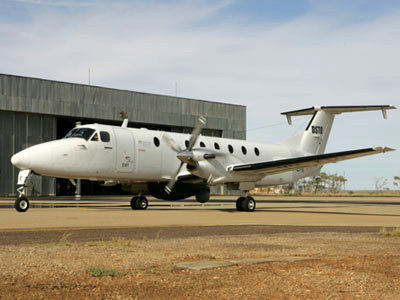 The DEAP is a Beech 1900C aircraft fitted with an AngelFire 2 wide area motion imagery sensor and a Wescam MX-20HD full motion video sensor. The Angelfire 2 sensor has a 96 MegaPixel electro-optic focal plane array capable of producing images at 3 frames per second. At 15,000 feet the footprint of the sensor is approximately 5km x 7km with a ground resolution of about half a metre. The MX-20HD is fitted with three co-boresighted video cameras: a high definition colour spotter camera, a high definition colour wide angle camera and a standard definition infrared camera.